Highly literate and expert musings on climate change, from home to the global theatre. Oil and Honey centers partly on climate change, a subject on which Bill McKibben (The End of Nature; Eaarth; founder of 350.org) is expert; but it is also personal in nature, a dualism reflected by the title. McKibben is concerned simultaneously with oil–representing fossil fuel industry practices and climate change–and honey. Having entered into a land-share agreement with his friend, beekeeper Kirk Webster, McKibben finds his home and Webster’s apiaries exerting a gravitational pull just as his political activism draws him far and wide. These two sides of his life–personal and political, local and global, analog and digital–are the focus of this combination memoir and call to action. The subtitle refers to his journey from writer to activist, by way of 350.org and the Keystone Pipeline–a trip he did not intend but found obligatory. Activist though he may be, McKibben remains a fine writer, evocative, articulate, clever and humble in examining his mistakes. In piercing prose, McKibben unites his longstanding authority on climate change with his novice stature in the world of beekeeping. He muses on the small-scale and private implications of our changing world, which incline him to work with his family and Kirk’s bees in his beloved local community in Vermont; and likewise on the necessity for global action to combat the continuing quest for fossil fuels. 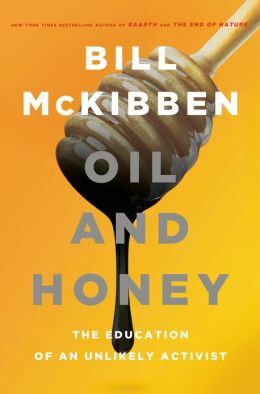 Oil and Honey travels the world but always cycles back, like the seasons, to McKibben’s Vermont home, likening global systems to beehives in a manner both profound and lyrical–and important. This review originally ran in the – issue of Shelf Awareness for Readers. To subscribe, click here, and you’ll receive two issues per week of book reviews and other bookish fun!